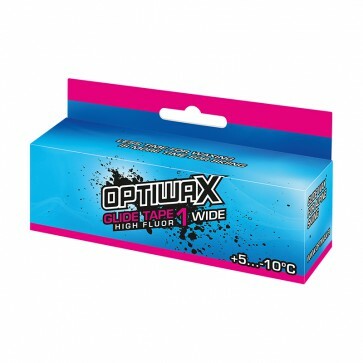 Optiwax Glide Tapes are number one choice especially for the beginners. Tape waxing can be done without special waxing equipment and it will offer almost race level glide until 200 km. The Glide tapes are also widely used by ski racers - the good durability has brought many good results in long ski marathon races. The Glide Tape Wide is the perfect choice for ski holidays when one wxing offers good glide for many days. Glide tape 1 is made for high humid conditions. It contains fluorocarbon, which increases glide properties on the wet and dirty snow. Glide tape 1 Wide is the perfect choice as universal glide for alpina and other wider skies. The tape is 120 mm wide and it offers same properties for ski as glide tape 1. - Attach tip or tail of the ski to the glide tape package and pull out the glode tape over the glide area of ski. - Heat the iron till 150-160 . You do not need a special waxing iron. Glide the iron slowly on the glide tape so that the wax will warm and attach on the ski glide surface. - After ironing pull the glide tape away and brush the ski. The ski is ready for a ride. Glide Tape used together with Optiwax Fluor block (solid) is a good way to obtain the extremely durable race waxing. - Rub a thin layer of Fluor block on the ski and pull the glide tape over it. - Iron the glide tape and Fluor block together and brush the ski. - Rub again the thin layer of Fluor block, then iron Fluor block by using used glide tape. - After letting th ski cool a little and brushing it you are ready for the start.